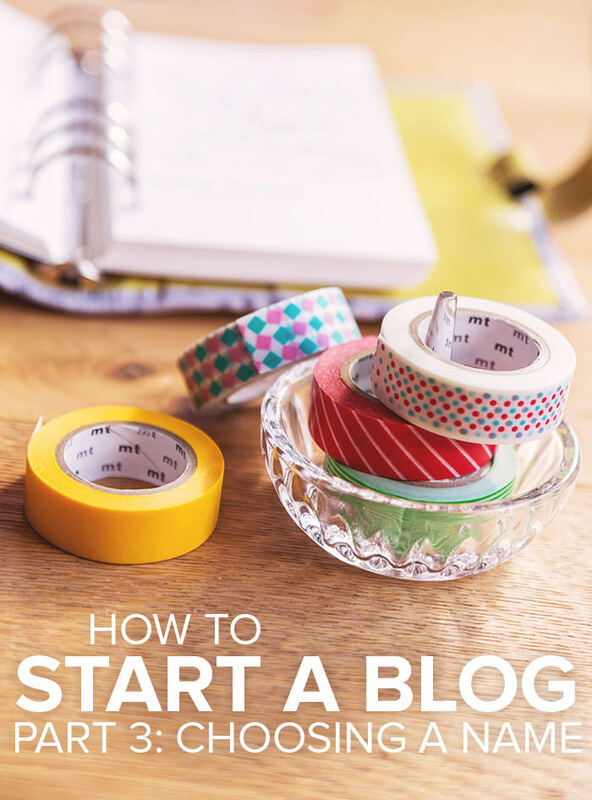 This isn’t my first post on how to choose a good blog name but I think I have some new points I can make for this series on how to start a blog. Choosing a name is probably the single hardest part about starting a blog. This is the thing that feels the most permanent. It’s easy to change your focus, it’s easy to get a new design, it’s even pretty easy to move to a new platform (usually). But picking a single word, phrase, or label that represents your entire online space is HARD and SCARY. Plus, it’s something you want to avoid changing down the line. Should your name represent your blog topics? I think this is one of the biggest points you need to consider. Should your name describe the things you talk about on your blog? Or should it be unrelated? Think about the future: will you be boxing yourself in? I chose a name that does not relate to what I discuss on the blog. This is because I know my topics will change over time. I started out blogging about books. While I still do that now, I do it a lot less. I also talk about WordPress, design, coding, business, and stuff going on in my life. I want to embrace the possibility that my topics will change yet again somewhere down the line. Having a name like, “Ashley Reads Books”, or “Ashley’s Library”, or “Badass Coding for Girls” would lock me into one topic. What if my blog moved in a new direction and the name was no longer relevant? I like a name that is timeless and can fit any topic. This allows me to grow and change my blog without also having to worry about changing my blog name. We’re all different and we all have different priorities. I know many bloggers who want their blog title to have “books” in there somewhere because they want to create a book blog. For some people, it’s very important to them that their blog title reflects the content within. This is a very personal decision and no one can make it for you. So what do you NEED in a blog name? 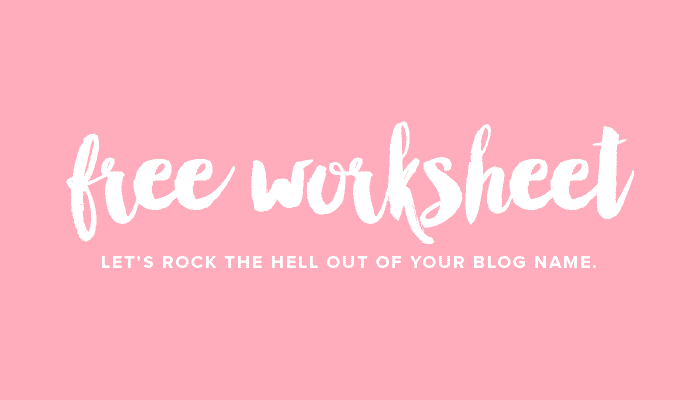 I generally think there’s a lot of room for creative freedom when it comes to blog names, but there are a few MUST HAVES if you want your name to be recognized and remembered. Your name MUST be easy to spell. Is that an “s” or a “z”? Is that “ey” or “ie”? If people are busy fumbling with spelling, they’re either not going to remember your blog name at all, or they’ll remember it but type the wrong URL into their address bar. Don’t make it hard for people to find or remember your name/URL. If you have dashes in your URL (like www.nose-graze.com instead of www.nosegraze.com) people will probably forget to put them in at some point. The “default” in the online world is no dashes, so that’s what most people try first. If your name isn’t available without dashes, then that might be a good indicator that the name isn’t unique enough and you’ll be competing with another blog/business. Dot com is the internet standard. It’s the first thing everyone will try when they visit your site. People remember nosegraze.com more than nosegraze.org or nosegraze.co or nosegraze.me. I’m a huge advocate of .com because it’s the easiest to remember and it’s the one that most people choose by default. If the .com version of your name isn’t available, that’s another good indicator that there is competition for that name. You want a name that’s unique, not a name that 5 other people are already using. If your name invokes imagery then it will be that much easier for people to remember. That’s why it helps if your name has powerful nouns or verbs. If someone can associate a picture in their head with your blog name, they’re more likely to remember it. 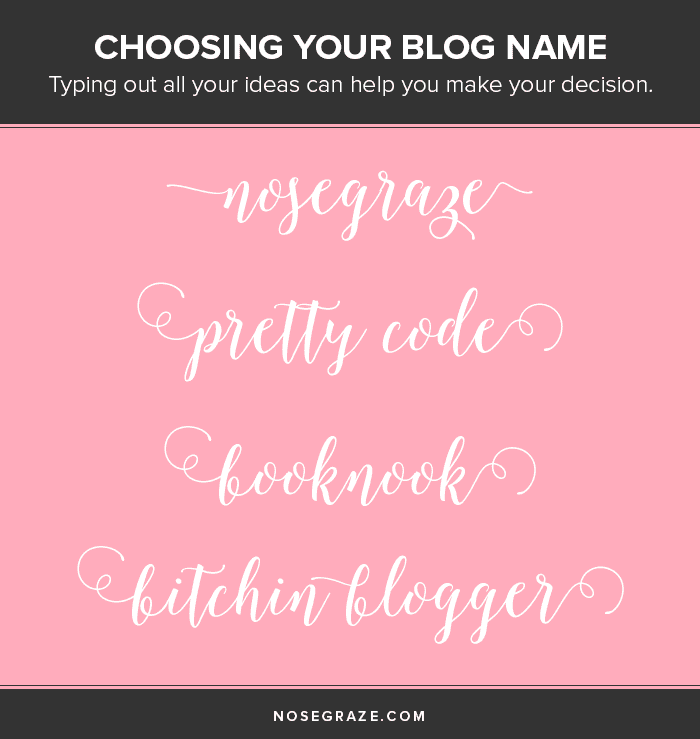 A free worksheet for choosing your blog name. Let’s go through a little exercise to come up with your perfect name. I’ve put together a PDF you can use to brainstorm ideas for your blog. We’ll try to find a common, emotional theme, brainstorm key words, and then combine and conquer (yes that’s a thing too)! Stuck between 5 choices? Write them out. If I have a lot of options and need to narrow them down, the first thing I do is open up Photoshop and create mockups of different logos. Even just typing them out in a nice font can make all the difference. Being able to VISUALLY see your choices and how the letters form can help you make your decision. With some names, the letters form together gracefully. Other names might have more awkward character placements/combinations that don’t look as elegant or ‘clean’. Spend A LOT of time thinking about your blog name. I’m a big fan of the “let it sit” approach. Once you’ve narrowed your names down to a handful of options, write them down and save them. Open up the document once a day or even just once a week and re-examine them. After a while of this, I find that I can start scratching more options off the list. Or I may even realize that I no longer like any of them, so it’s time to go back to the drawing board. Choosing a name is a huge decision and you shouldn’t rush through it. Take your time. It’s better to get it right the first time than have to worry about changing your blog name later (but don’t worry, I have a post that will walk you through that too 😉 ). Let’s talk about blog names! What kind of names really catch your eye? Do you like names that relate to the topic of the blog, or do you prefer a more universal name? Coming up next: rock that effing about page. This such a helpful series, Ashley. I cannot imagine how many people will be benefiting from the lovely worksheet that you made. I really opened my blog with no second thoughts about its name. I wish I had the stimulating worksheet then! I love the idea of choosing a “theme” as well. It really puts a lot into perspective. Thinking of it, I should try enforcing one….when I get the time. Thanks for being the inspiring person you are. You really do a lot for the blogging community! ALSO THE NEW DESIGN IS SOOOOOOO AMAZING. LOVE IT! YOUR ABOUT ME PAGE OMG. Oh, Chrys is a cute name. 🙂 I feel like it’s very unique and recognizable in the blogosphere. I’m so glad you love the new design! 😀 Thank you!! Wow! What a great post. Didn’t you just change designs? For me it was easy because I will only ever review audiobooks, hence the name, I thought it would be easy to bounce around different genres if needed. I can’t wait for the about page post, thank you! Since you’re committed to reviewing audiobooks, I think your name is a perfect fit. I feel like not many people specialize in that, and this makes it easy for audiobook lovers to find you. I’m so glad you like it 😀 Thanks Priscilla! I have a question! I don’t plan on changing my blog name or anything, but one of your points sparked a question from when I was thinking up a blog name. You said if the .com is already taken it’s probably a sign of competition for the name? Well, my .com was taken, but no one is actually using it. I think it’s one of those “squatting” or whatever it’s called situations. I did make sure to search my blog name before I settled on it, and nothing else came up, so I stuck with it. It wasn’t until a few months later that I went for hosting and had to go for the .net (which I don’t think is too hard to remember, and my blog is the first during a search anyway). So would you have still recommended choosing a different name, even though it was a unique name but someone else was parking on the domain? I’m just curious. I think in your case it’s not much of a problem. If it were me, I probably would have chosen something else, but that’s just because I’m a HUGE supporter of .com and it’s hard for me personally to pick anything else, you know? But I don’t think you necessarily made the wrong choice or anything. You’re not really competing with someone else for this name and you’ve certainly made it feel unique and recognizable in the blogosphere. Great post! I am in the process of creating a whole new blog and it all started with my wanting to change my blog name. Like you said, it’s really important to decide whether you want to choose a name that is specific to your content or not. I did initially choose a name that boxed me in (SIK Book Reviews) and now I regret it. When I started, though, I had no idea I would ever want to blog about anything other than books. Now, I have decided to blog about other interests and, therefore, feel like I need to change my blog name. This time around, I picked a name that allows me to talk about really anything. I just need to finish all the tweaking and get my site up and running!! Yeah I know it’s hard to come up with a name that you’re comfortable sticking with for years. Just like we’re drawn to new blog designs every few months/years, we can sometimes be drawn to new names. Great post Ashley! My blog name was an accident, originally it was supposed to be “What Georgie Reads” to act as an extension of What Georgie Did but when I registered my name I had a moment of complete wipe out and put What She Reads instead… woops?! In some ways my blog name is quite easily remembered but it does surround one thing: reading, and it doesn’t allow much extension anywhere else. I tried implementing more design into my posts but it felt false with the name. I’ve been thinking about putting both blogs together so it’s not just about books but I just feel it may be too much of a hassle at this point. I think maybe if I didn’t space out when buying my domain it would’ve been a lot easier migrating the blogs together as the names would’ve been fairly similar. I’m definitely going to think on that for a while. I think it would be fantastic if you combined both blogs together. I know it feels like a hassle, but that’s definitely what I would do if I were you! One of the things I have planned is merging Creative Whim and Nose Graze, because I don’t like having two separate entities like that. Another great post, Ashley. When I started my blog I knew that I was going to be focusing on crime ficiton, so I through about that and when I remembered that BOLO was the police acronym for Be On the Look Out, I knew that BOLO Books was it! You just get a sense that something is “right”. From there I went to the logo. I really think that in this day, you have to have something that works well as the website logo AND a social media icon. I loved the idea of the eyeballs as the “O” in BOLO, so a design was born. Take just one eyeball, put a book in front of it and you have a perfect Twitter icon. I am much better known by the eyeball logo than by the blog name or my name. That said, originally, the eyeballs on the website were bloodshot – intended to indicate staying up all night reading – but feedback from the public led me to believe that they kind of creeped people out and made them think of horror books. I dropped the bloodshot element and immediately, the logo felt fresh and more appropriate. The lesson, listen to the public and be flexible while still knowing that once you pick something, you are locked in to a degree. I had no idea what BOLO stood for—that’s awesome! You definitely have a perfect Twitter icon. 🙂 It’s very unique and recognizable, even at a small size. I think removing the bloodshot element was a good call! Posts like this reminds me how I choose my blog name in a hurry and while I like it, it doesn’t convey the full extend of what I do on my blog, as only half or less of my content is reviews. Ah well, I decided to just stick with it and mainly use the name Lola as my brand. Luckily there aren’t too many other bloggers out there with the same name. I think this is a great post and helpfull for new bloggers. Choosing a blog name is really important and it’s a good idea to take your time deciding on a name. Changing your name later is possible, but more difficult than just havign the right name from the start. Lola is a good brand name. 🙂 It’s a fantastic name but not super common. This is a great post! When I initially started book blogging I picked a SUPER boxed in name because it only included books. Near the end of last year though I realized I wanted a blog that was about books, but also included my life and travel experiences as they happened. I wanted somewhere that encompassed ALL of the things I’m passionate about. So I rebranded and picked a name that suited what I want my life to be, which is a daring adventure. I’m SO pleased that I made the move and changed my name. 😛 I feel like I have more wiggle room to blog about anything I want now, and “life” posts don’t have to be special things that happen every once in awhile. I can do them as I see fit because they actually fit with my blog now. Congratulations on your name change Sydney! It’s amazing how much more confidence you can gain by settling on a name that you’re INSANELY happy with. If you have a name you’re not happy with, you can lose all of your blogging drive and motivation. But a new name that you love can light a fire under you and make you want to BLOG UP A STORM! I love this post Ashley! You have such creative and helpful tips ideas to help with everything blogging related. I wish I had your pdf about a month ago when I decided to get a self hosted blog. lol. I had two names that I was stuck between, but I ended up with this one. I really am liking it more and more, because I am a person who loves words tremendously. I feel it suits my personality and allows me to post about whatever I want. Most people may not know what my name means, but I hope it sticks with them after visiting. I’m so glad you like it, Mary. 🙂 I’m so glad you’re loving your name! I think that’s a really important part of loving your blog and staying motivated. Mel@thedailyprophecy recently posted: Blog Tour: Maria Snyder – Shadow Study. Yeah I’ve even changed my name too. 🙂 It used to be pretty unoriginal and totally bookish, so I’m glad I made the change. But it’s always going to be easier to just get it right the first time and not have to go through a change/migration! I think you made a good choice with your name. 🙂 There’s not really anything else like it in the blogosphere. I think it’s easily recognizable as being your blog! Pingback: Weekly Recap| Mar 22-28, 2015 | Oh, the Books! This has been really helpful. I’m stuck, I can’t seem to think of any name. After reading this I think it’s important to wait and come up with a few before starting. I’m glad I came across this. Ashley I could not have found your blog soon enough. I am recent to this new world of IT and was thinking I might like a blog to do my rants and raves from time to time but you have opened my eyes to it being a much more useful thing. I will have to do a study of your post before I implement anything in the way of a blog for myself. It does seem a little daunting I must say.